For 50 years now, the Cuban crisis has been one of the most widely discussed Cold War episodes. Although lasting less than a fortnight, it had a great lasting impact on global politics. And the arguments over why it happened and who benefited most from it are still going on. Click to enlarge the image. Drawing by Dmitry Divin. From October 16-28, 1962, the United States and the Soviet Union faced off in one of the most dangerous moments of the Cold War. After a U.S. spy plane took pictures of Soviet nuclear missiles being deployed in Cuba – just 90 miles from Florida – and diplomatic discussions did not bring any results, the U.S. Navy launched a “quarantine” regime around the island to prevent Soviet ships from bringing in more weapons. Every vessel going to Cuba was to be searched by the U.S. military. The Soviet side considered this a blockade, and an act of aggression. Soviet ships were ordered to ignore the quarantine and continue their way to Havana. A 40,000-strong Soviet military contingent armed with tactical nuclear weapons was already deployed in Cuba and was ready to use its arsenal to prevent an invasion. Several medium-range ballistic nuclear missiles capable of reaching the U.S. mainland were also already deployed in Cuba. Despite the quarantine enforcement, Soviet specialists continued constructing missile sites and Soviet submarines continued their travel to Cuba. In one episode of the crisis, Russian submarines were forced to surface by U.S. aircraft and battleships; in another, a U.S. spy plane was shot down over the island by a surface-to-air missile. As the construction of the nuclear missile positions was nearing completion, the two sides found a compromise – the Soviet Union would withdraw its troops and weapons from the island, while the U.S. would lift its quarantine and refrain from further attempts to overthrow the Cuban leadership as well as withdraw its missiles from sites in Italy and Turkey. From a historic point of view, this dramatic 13-day standoff must be viewed as part of the international relations system of the time, not as a separate incident. One of the key questions still being discussed is why the Soviet leadership started what later became known as the Cuban missile crisis. Although the formal goal of the military contingent deployment was to protect Cuba’s sovereignty, this in itself could not be the main reason for a military operation of that scale and potential risk. 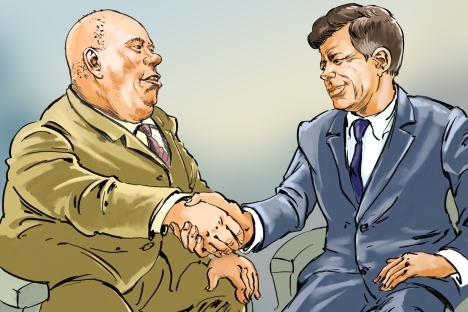 According to reports, the idea to deploy nuclear missiles in Cuba came to Soviet leader Nikita Khrushchev shortly after his visit to Bulgaria when he learned that the U.S. had ballistic missiles stationed in Turkey and Italy. The Soviet nuclear arsenal was significantly smaller and less technologically advanced than that of the U.S., and from the Soviet perspective, nuclear missiles in Turkey were a threat that needed to be either addressed or balanced symmetrically. The government of Cuba, which had come to power in 1959 under the leadership of Fidel Castro and had repelled a U.S.-organized attack in 1961, seemed a perfect ally: It was located very close to the U.S. and was looking for friends. By deploying missiles in Cuba, Moscow counterbalanced the nuclear missiles in Turkey and won a bargaining chip that could be used to negotiate the missiles’ withdrawal. According to Robert Legvold, director of the Euro-Atlantic Security Initiative at the Carnegie Endowment for International Peace, another goal was to stabilize the situation in divided Europe, as Soviet missiles in Cuba could be used as a deterrent against action by American forces in Western Europe. But even after 50 years, the question of who benefitted the most from the crisis remains a subject of intense debate. According to Ivan Timofeev, program director of the Russian Council for International Relations, with the withdrawal of Soviet missiles and troops from Cuba, all parties to the conflict achieved their goals: the U.S. drove a nuclear threat away from its borders and demonstrated to its allies its ability to protect its interests and resolve international crises; for its part, the Soviet Union showed that it was capable of projecting power globally, since the U.S removed its missiles from Italy and Turkey; finally, Cuba was assured that there will be no further attempts at its sovereignty. However, there is another component to the Cuban crisis that is often overlooked – its consequences for the doctrine of deterrence. Today, 50 years later, the most important legacy of the crisis is its status as the last time the two superpowers seriously considered launching a nuclear attack against each other. According to Legvold, the psychological impact of having narrowly escaped a potential nuclear Armageddon profoundly influenced U.S. and Soviet policymakers and led them to take more seriously the need to establish limits on the strategic nuclear contest, and, thus, facilitated what became by 1969 the Strategic Arms Limitation Talks. After the Cuban Missile Crisis, the Cold War continued for nearly 30 more years and the U.S. and the Soviet Union repeatedly confronted each other in “proxy wars,” but a nuclear strike was no longer an attack weapon, only a means of strategic deterrence that kept nations from a World War III. Alexey Dolinskiy spent several years working in Russian public diplomacy and taught a class on public diplomacy at the Moscow State University. His research experience includes contributing to Harvard Berkman Center for Internet and Society and United Nations Peacekeeping Situation Centre. Currently he works in corporate diplomacy in the Asia Pacific region and in Europe. Alexey graduated with a Master's degree in Law and Diplomacy from the Fletcher School and later defended his PhD in political science.